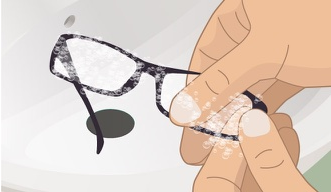 Proper cleaning of your glasses is the ideal way to keep them in top condition and helps to prevent scratches to the lenses. 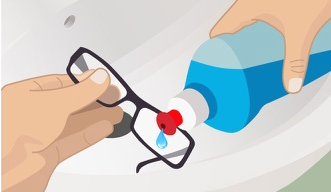 Like all things there's a right way and more than one wrong way — So following these tips when cleaning your glasses will help you to reduce those annoying scratches to your lenses. Make sure your own hands are clean beforehand, wash and dry them thoroughly. Use a soap or hand wash that is lotion-free and then ensure you dry them with a clean, lint-free towel. could be transferred to your lenses is the first step to protecting your lenses. 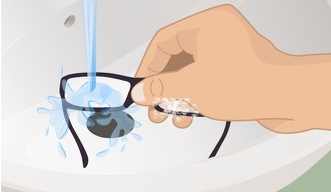 Using at most lukewarm water as a gentle rinse for your glasses. Avoid hot water, which can damage some eyeglass lens coatings. Rinsing helps to remove debris and dusts, which in turn helps avoiding those scratches from incurring while you are cleaning. Use just a small amount of a dish washing liquid that is lotion-free to both lenses. Ensure you use only those that do not include lotions or hand moisturizers. You can either apply directly to the lenses or first to your fingers and then the lenses, just remember most dish washing liquids are concentrates, so you will need only a very small amount. With your fingers gently rub both sides of each lens and the surrounding frame. If they seem a little dry, add just a little more water at this stage. You want to clean the lenses and at the very least the frame and nose pads around the lenses to remove oils etc that build up and are easily transferred back to the lenses later on. Ensuring to get into the areas where the lens edges meet the frame and build-up occurs. There is no harm in cleaning the entire frame at this point if you like especially the temple tips behind the ears as this is another place oils tend to build-up. It's important to thoroughly rinse off the glasses at this point, again using at most lukewarm water. Leaving any soap traces behind will only cause the lenses to be smeared later on. Remove excess water by shaking your glasses with a gentle amount of force only so as not to bend or damage the frame. At this point inspect them to ensure you have not missed any debris or dirt and repeat the previous steps if needed. Using a clean and lint-free glasses cleaning cloth, carefully dry the lenses and frame.  Ensuring your cloth is perfectly clean here is important to help you avoid scratching the lenses while cleaning. Minor smudges or streaks at this point can normally be removed with your optical lint-free cleaning cloth. Remember to keep your cleaning cloth clean. You can add it to your normal clothes washing if you like, just ensure it's free from anything after the wash cycle like to much washing powder, a simple rinse is normally all that is needed if there is. Or even better simply hand wash your optical clothes as this is often the best way to ensure they clean and free from debris that can scratch your lenses. 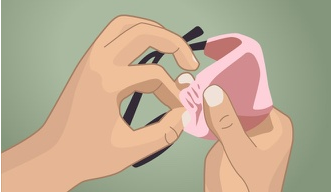 When you are not wearing your glasses the safest place for them is in their CLEAN and UNDAMAGED case. NEVER place them on a table or counter with the lenses facing down. 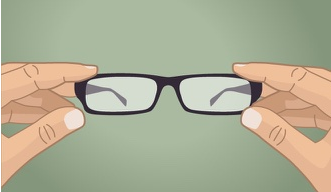 If you don't have your case with you then, place your glasses upside down and with the temples open (they are normally most stable this way round than right-side up) — put them somewhere where they won't get something else placed on top of them or knocked off and onto the floor etc. Most of the time clients tell us scratches and other damage actually occurs when they are not wearing them, so ensuring your keep them in their case is the best protecting you can give them. This includes when you take them off at bedtime, many clients tell us this is actual when they have a problem and glasses get sat on etc.